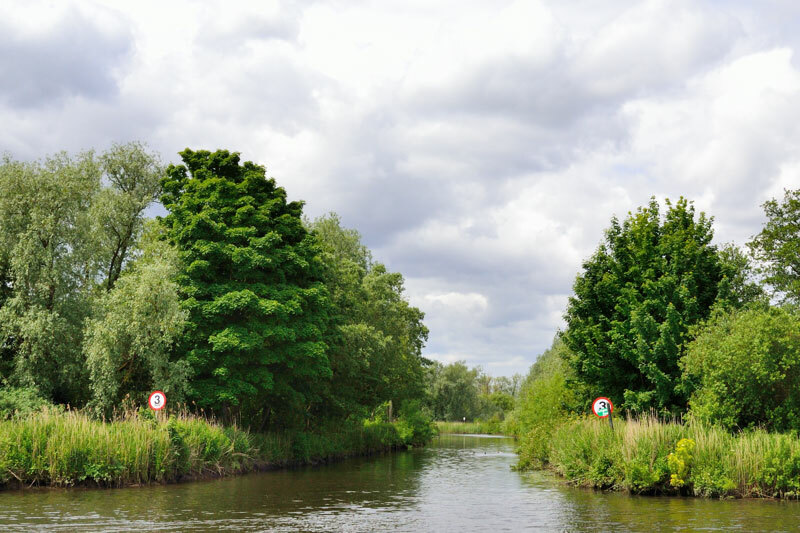 This section of the River Yare consists of a mixture of scrub land and flat open grazing marshes, later nearer Surlingham, becoming more wooded with a mixture of Carr woodland and open Fen. On the left after passing underneath Postwick Viaduct is Postwick Grove and Postwick Marsh. In the 19th century the grove was a popular beauty spot often depicted in paintings by the local artist John Joseph Cotmam. From here to Bramerton the river is designated as a water ski zone. On the right is the sewage outlet from Whitlingham sewage works, surprisingly a popular spot for local fishermen. As the river heads towards Bramerton it meanders around Postwick Marshes in a large horseshoe with views over the grazing marshes to the left. Shortly on the right is the Woods End Tavern now renamed Waters Edge with moorings for patrons. Next door to the inn is a small chandlers specialising in boat covers, canopies and upholstery. 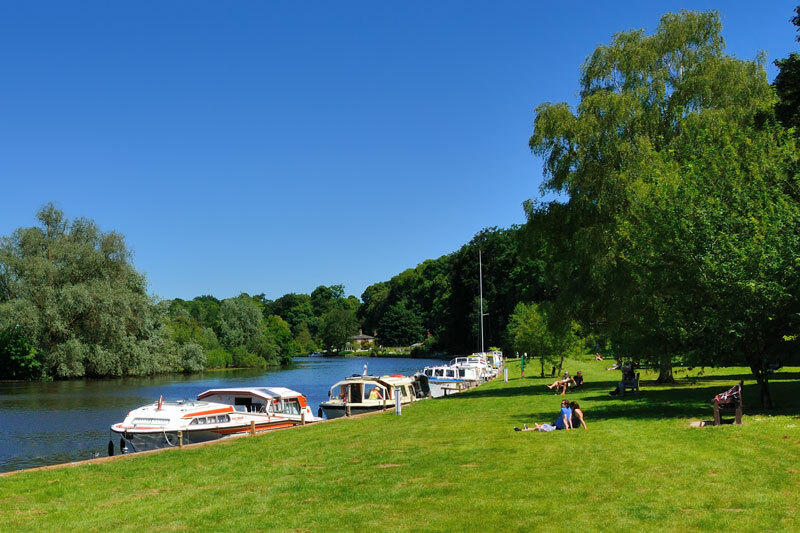 A little further downstream are the extensive Broads Authority moorings at Bramerton Common. 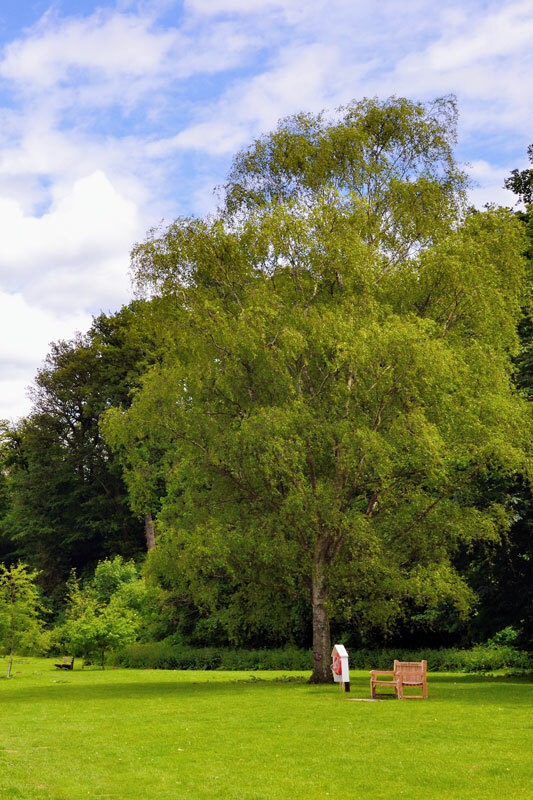 Bramerton Common is a beautiful spot to moor, it has a wide grassy area running the full length of the moorings with views across the grazing marshes to the north and a wooded ridge to the south. At the western end is an electrical hook up point and adjacent to the car park an information board. Also on the common is a sculpture by Barry Mason entitled ‘Zenith’. The sculpture comprises of a copper disk, through which is drilled an accurate map of the night sky. This is supported on carbon fibre poles, that mimic the structure of trees and wherry masts. At the back of the common is Bramerton Pits a Site of Special Scientific Interest (SSSI). Geologists have studied the pits here since the 19th century. The wooded hill conceals an area of shelly silts and sands known as Norwich Crag. The crag was laid down around 1.8 million years ago during a period known as the Pleistocene. The varied fossil marine shells found here suggest at one time sea levels were a lot higher, possibly stretching right up to Norwich. 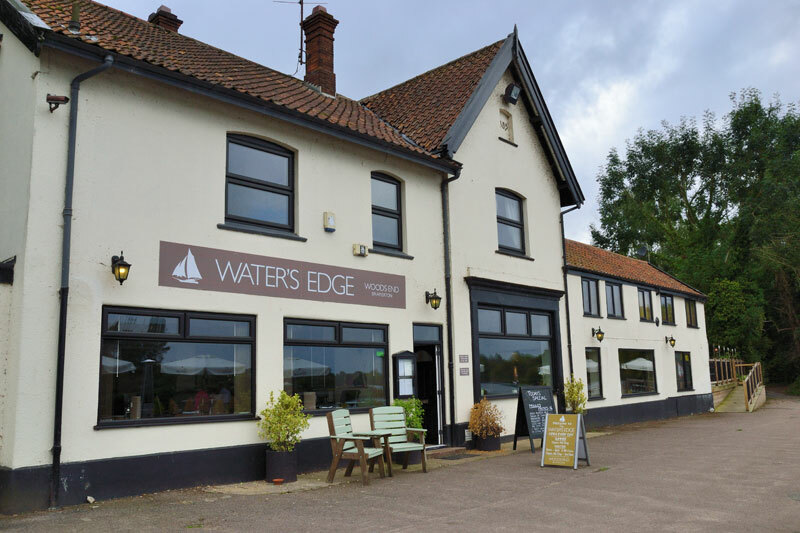 The Waters Edge at Woods End has new owners and has recently been refurbished. Inside the interior is clean and fresh with a new bar and seating area with wooden floors and soft leather covered chairs. There are plans to open early for morning coffee, ideal for walkers on the Wherryman’s Way or boaters wanting to enjoy a late breakfast. Moorings are available for patrons. 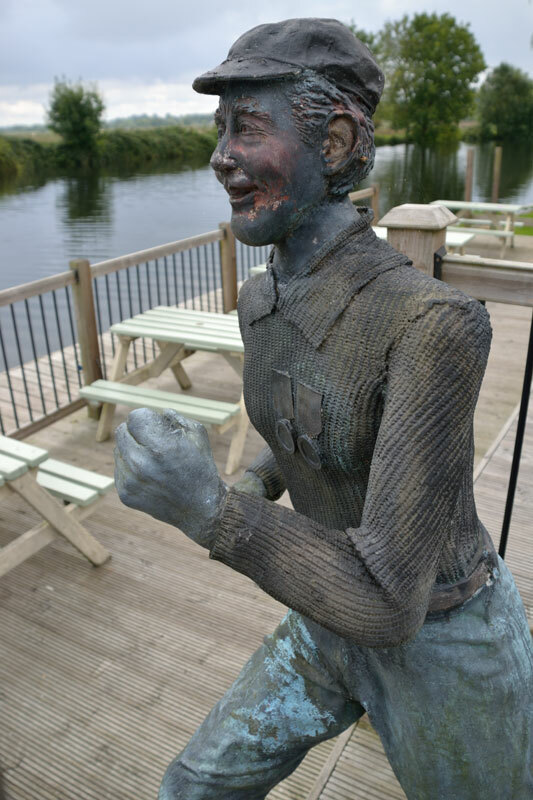 Outside the Waters Edge is a sculpture of a local character, William Cullum or Billy Bluelight as he is famously known. 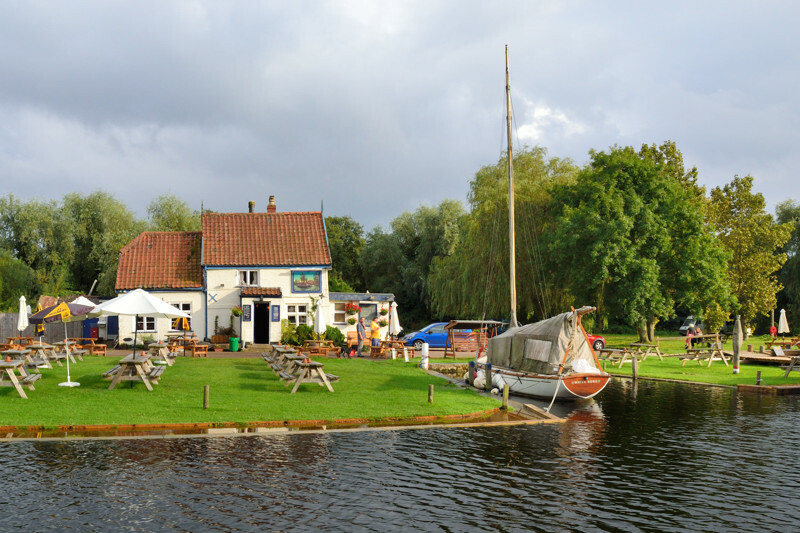 Billy was a wiry athletic man who had taken to racing the wherries and trips boats as they journeyed along the River Yare. Wearing just a vest, long white shorts and a striped cricket cap he would shout out his challenge. ‘My name is Billy Bluelight, my age is forty-five, I hope to get to Carrow Bridge, before the boat arrive’. He would then run the five miles from Bramerton to the old bridge at Carrow. On the boats arrival he would be greeted with cheers, loud applause and a few pennies from the day trippers. On leaving Bramerton the river continues on a horseshoe bend around Postwick Marshes passing Surlingham Church Marsh on the right. The river makes two tight turns before reaching Surlingham Ferry. 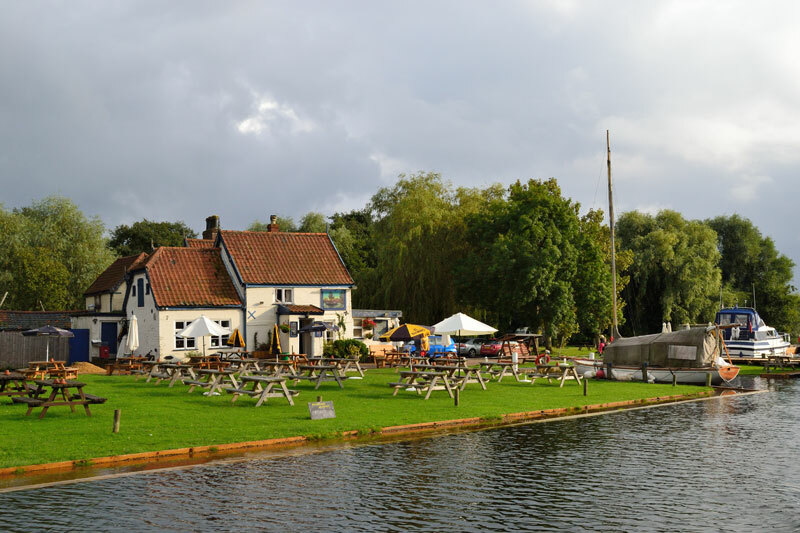 On the left is Postwick Wharf with moorings for three boats on the right is Surlingham Ferry House with moorings for patrons. The 18th century Ferry House at Surlingham with it’s attractive gabled roof is set amongst trees on the south eastern edge of Surlingham Broad. A chain ferry operated here until 1939 when operations ceased after it collided with a coaster. The Ferry House is a traditional pub, with a warm and welcoming atmosphere. It has been run by the same lady, Sonia Cox for over five years and has developed a reputation for good home cooked food at reasonable prices. It is dog and family friendly and serves food all day between 12pm and 9pm. The beer garden beside the river has plenty of seating for relaxing in the sunshine. Also nearby is an old wherry mast set into the ground, a plaque mounted on the swing arm provides information on the local area. There is an opportunity here to take in a section of the Wherryman’s Way. The walk of 2 miles includes visiting the ruins of St Saviour’s church and the bird hide on Surlingham Church Marsh. St Saviour’s is the final resting place of the Norfolk naturalist Ted Ellis. The river now enters a denser section of fen and carr woodland. Hidden behind trees on the right is Surlingham Broad, over the years it has shrunk considerably but parts are still navigable. On the left after a short relatively straight section is Brundall Gardens Marina (private). Brundall Pleasure Gardens were created in the late 19th century and by the early 20th century were probably the most popular visitor attraction on the River Yare. It consisted of 76 acres of gardens with a series of ponds that tumbled through a wooded valley to a lake. The gardens had it’s own yacht basin, tearooms and even a riverside hotel. 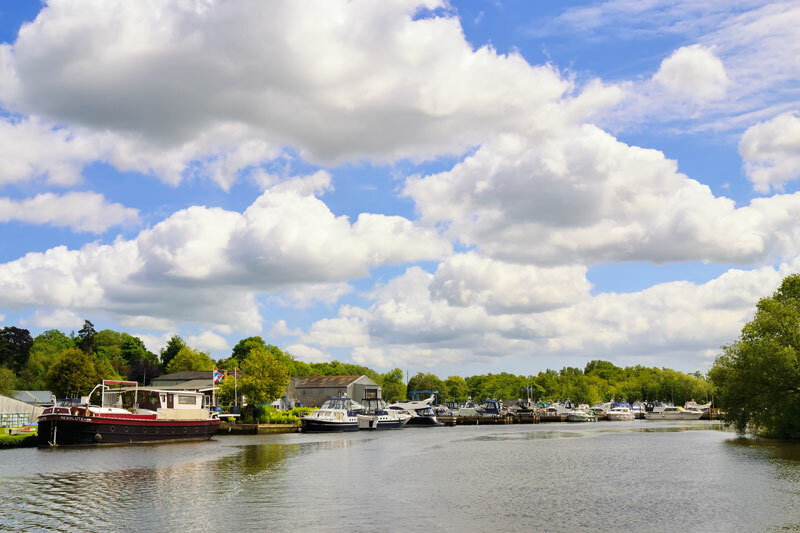 The site was requisitioned during the second world war and today the area is home to a number of business including a private marina. Part of the gardens at Lake House can still be viewed through the National Gardens Scheme. Lake House is open by appointment (£4 Admission) from the middle of January until December and is a ten minute walk from Brundall Gardens station. 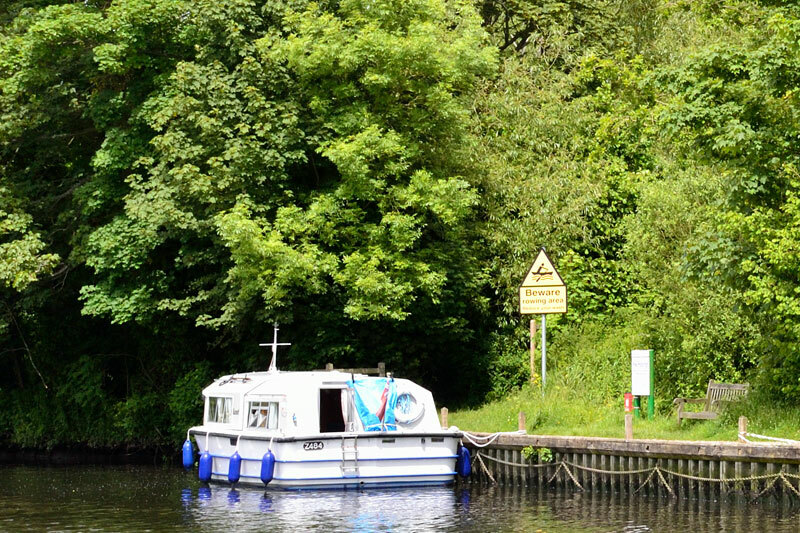 There is unfortunately no access from the river other than mooring at Brundall and going by train. 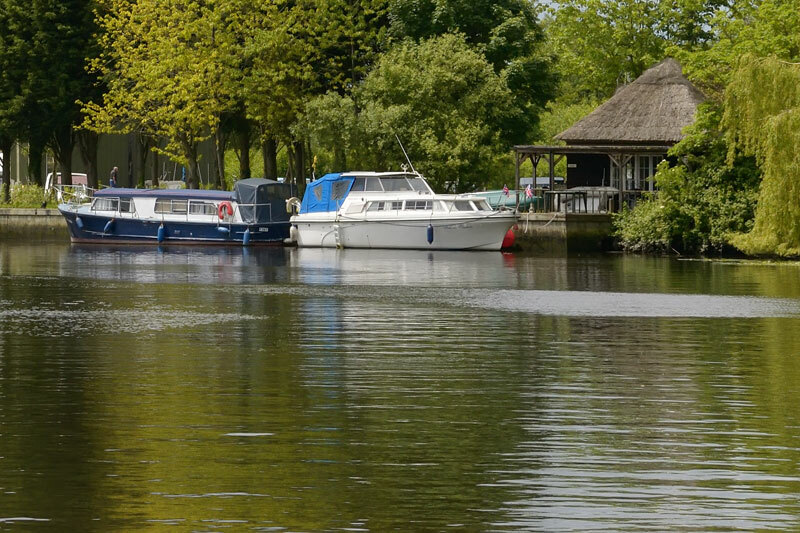 The Yare meanders around Brundall Gardens Marina, slow down here and watch out for boats manoeuvring. This is another lovely wooded section of the Yare, gently meandering towards Brundall. 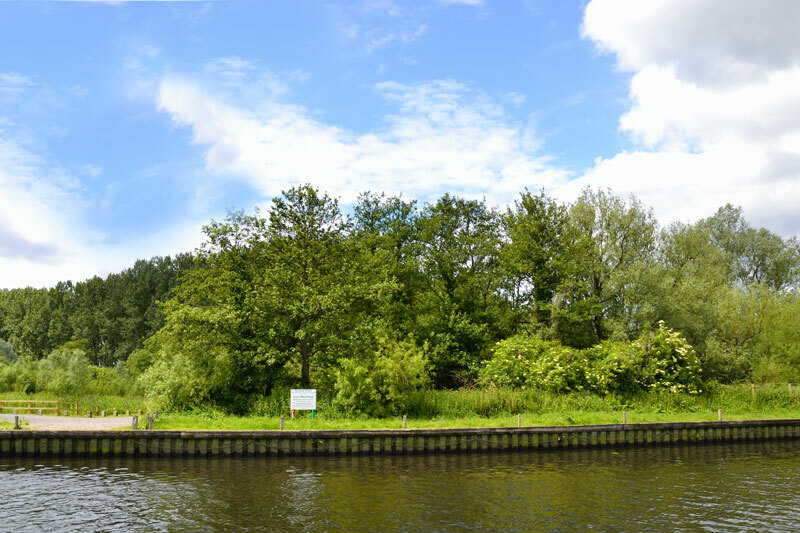 Shortly on the left is Brundall Church Fen Moorings, with space for four boats. A little further on, on the right is Birds Dyke leading to Bargate Broad, an open sheet of water part of Surlingham Broad, with another dyke to the east which leads back onto the Yare. Moorings is available by mud weight. 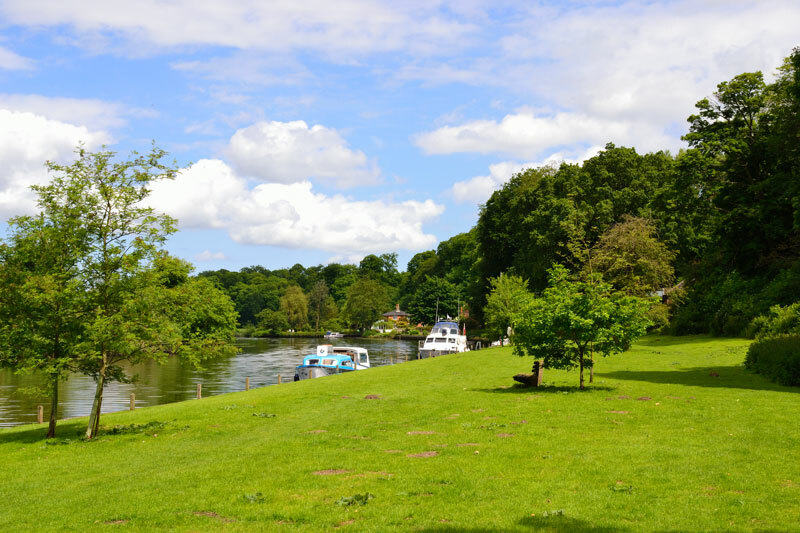 Surlingham Broad covers an area in excess of 200 acres, the majority of which has silted up leaving just Bargate navigable to hire cruisers. 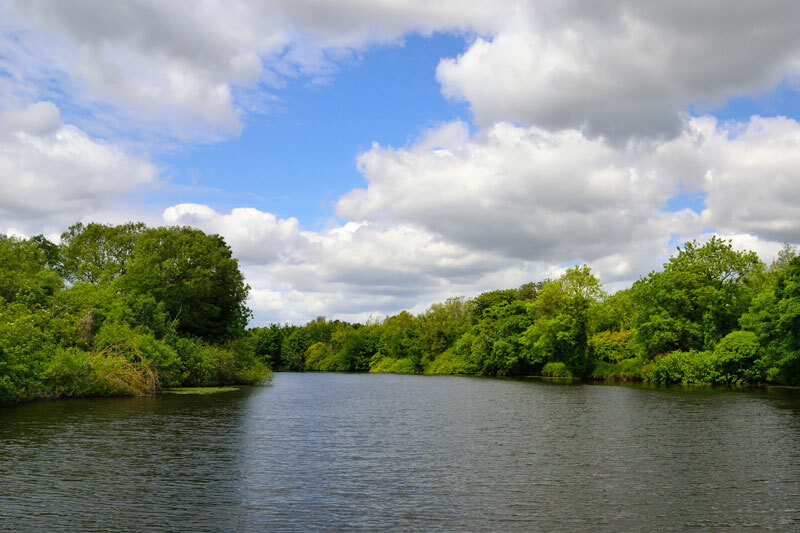 It was on Surlingham Broad in 1952 that stratigrapher Joyce Lambert discovered that the Norfolk Broads were man made, formed from peat diggings that later flooded. At the time it caused a sensation as they were previously thought to be natural. Bargate on Surlingham Broad contains a wherry graveyard known as Harbrough’s Graveyard, it contains the sunken remains of 13 wherries. 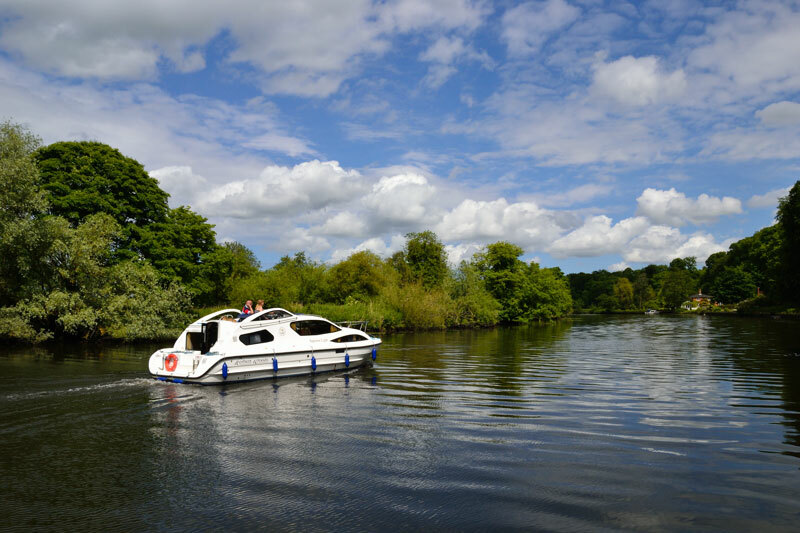 For smaller un-powered craft the broad is an unspoiled paradise consisting of shallow interconnected waterways leading to stretches of open water with names like Bunney’s Broad and Newman’s Hole. Access to these areas is constantly changing depending on the season, state of the tide and if any management work has taken place. On arriving at Bargate it should be possible to paddle to Surlingham Parish Staithe. Getting lost on these quiet stretches of water is a distinct possibility so some form of navigational help would be a good idea. In the past ribbons have been tied –like leaving a paper trail, to be collected on the return journey. Slow down as Brundall Reach is approached.